Julie Morrigan once again proves that not only is she talented but she is also versatile. I've read three titles by Morrigan this year and quite frankly any of them is worthy to have pride of place on the shelves of a major book retailer as opposed to the tiny digital coffin that is the modern e-reading device. Morrigan deserves all the success that a major publishing contract might bring. However, as with Andy DuFrane from the Shawshank Redemption some birds should not be caged as their feathers are just too bright. The diversity Morrigan has brought us with her titles this year would not be allowed by a dollar obsessed traditional publisher that is of course totally their loss and our gain. This reader for one is overjoyed that she self-publishes her work. 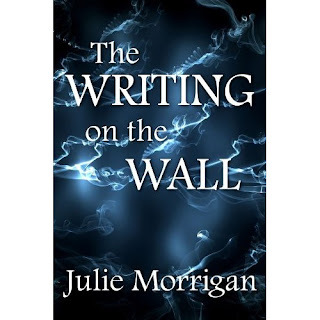 Released in time for Halloween the Writing On The Wall brings us several chilling tales. Shadow Man - A straightforward chiller that does a great job of suggesting more than it shows in classic horror tale style. The Black Dog - A contender for my favourite of the collection. Artefacts such as books contain power as we learn from this brilliantly told tale. Chocolate Button Eyes - One to make you shudder and proof if ever it were needed that danger does not always emanate from a masculine source. So Many Summers - A story that left me melancholy as it did a great job of reinforcing the brutality of life. As always with the best stories a clever twist ensures you remain captivated throughout. The Project - A short intelligently told tale in which we learn that torment can come from unlikely and distant sources. Seasons Of The Witch - A tale that is written in the style of a modern fairy tale and proves very effective indeed. Fabulously compelling. The Writing On The Wall - The set piece of and title story for the entire collection. I read this and found that it was so well written it was almost 3D HD. A very "cinematically" written story which frankly could be made into an excellent movie. I am in awe of Morrigan's talents. Frigid Air - A guest appearance by Steven Miscandlon who edited, proof read and carried out graphic design work on the cover. He proves to be a fine writer too in this great tale. I most liked the wit and humour that he carefully wove into the narrative like little chuckle mines in a minefield awaiting a hapless foot to step on them. A fine story well told. Gone Bad - A collection of short stories featuring dark deeds. Heartbreaker - Julie's latest novel released in October 2011. Oooh, more Julie Morrigan, excellent. Gone Bad is one of the best short story collections I've read and this sounds like a winner too.